CHICAGO; September 22, 2013—A fear memory was reduced in people by exposing them to the memory over and over again while they slept. 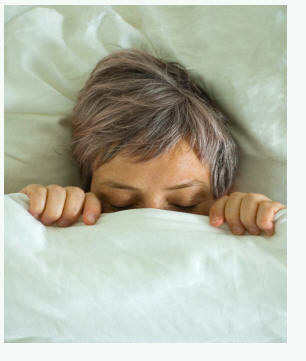 It's the first time that emotional memory has been manipulated in humans during sleep, report Northwestern Medicine® scientists. The finding potentially offers a new way to enhance the typical daytime treatment of phobias through exposure therapy by adding a nighttime component. Exposure therapy is a common treatment for phobia and involves a gradual exposure to the feared object or situation until the fear is extinguished. "It's a novel finding," said Katherina Hauner, a postdoctoral fellow in neurology at Northwestern University Feinberg School of Medicine. "We showed a small but significant decrease in fear. If it can be extended to pre-existing fear, the bigger picture is that, perhaps, the treatment of phobias can be enhanced during sleep." Hauner did the research in the lab of Jay Gottfried, associate professor of neurology at Feinberg and senior author of the paper. The study will be published Sept. 22 in the journal Nature Neuroscience. Previous projects have shown that spatial learning and motor sequence learning can be enhanced during sleep. It wasn't previously known that emotions could be manipulated during sleep, Northwestern investigators said. In the study, 15 healthy human subjects received mild electric shocks while seeing two different faces. They also smelled a specific odorant while viewing each face and being shocked, so the face and the odorant both were associated with fear. Subjects received different odorants to smell with each face such as woody, clove, new sneaker, lemon or mint. Then, when a subject was asleep, one of the two odorants was re-presented, but in the absence of the associated faces and shocks. This occurred during slow wave sleep when memory consolidation is thought to occur. Sleep is very important for strengthening new memories, noted Hauner, also a research scientist at the Rehabilitation Institute of Chicago. "While this particular odorant was being presented during sleep, it was reactivating the memory of that face over and over again which is similar to the process of fear extinction during exposure therapy," Hauner said. When the subjects woke up, they were exposed to both faces. When they saw the face linked to the smell they had been exposed to during sleep, their fear reactions were lower than their fear reactions to the other face. Fear was measured in two ways: through small amounts of sweat in the skin, similar to a lie detector test, and through neuroimaging with fMRI (functional magnetic resonance imaging). The fMRI results showed changes in regions associated with memory, such as the hippocampus, and changes in patterns of brain activity in regions associated with emotion, such as the amygdala. These brain changes reflected a decrease in reactivity that was specific to the targeted face image associated with the odorant presented during sleep. “Stimulus-specific enhancement of fear extinction during slow-wave sleep,” Katherina K Hauner, James D Howard, Christina Zelano & Jay A Gottfried. Nature Neuroscience. Published online: 22 September 2013, doi:10.1038/nn.3527. Press materials provided by Northwestern University.